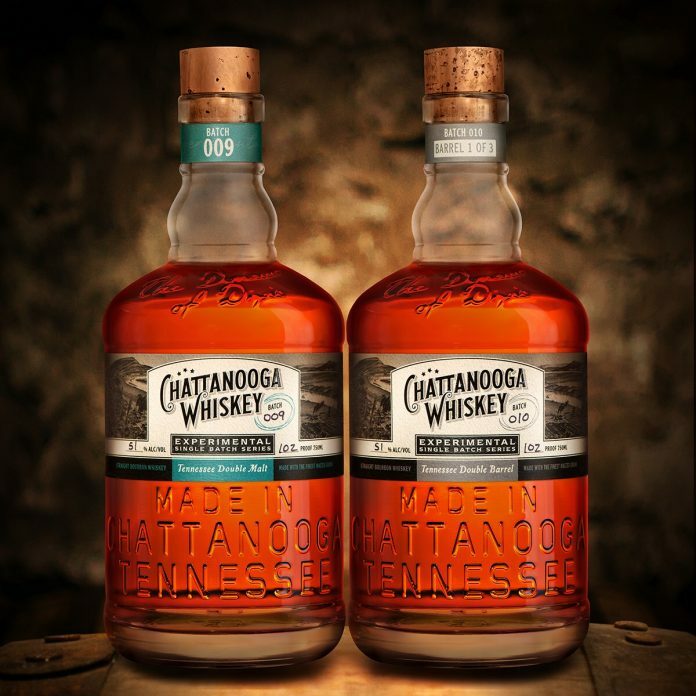 Chattanooga Whiskey has announced the August 10th release of Experimental Series: Batch 009 & 010, both hand-crafted at the Chattanooga Whiskey Experimental Distillery in downtown Chattanooga, TN. Batch 009 is Tennessee Double Malt and Batch 010 is Tennessee Double Barrel. This dual release marks the 9th and 10th batch to be released exclusively from the first 100 barrels matured. Batch 009: Tennessee Double Malt contains over 55% malted grains – including malted barley, rye, wheat, and a rare floor malted corn. Hand crafted at Valley Malt, the corn was malted in a labor-intensive process of hand turning the germinating grain in open air, on an open tile floor. This process – traditionally reserved for barley – is said to develop flavors in the malted grain that modern methods cannot reproduce. Aged for more than 2 years and bottled at 102 proof with 300 cases produced, Batch 009 will release for distribution in Tennessee, Georgia, Alabama and South Carolina. Batch 010: Tennessee Double Barrel, is a series of straight Bourbon whiskies finished in 3 different, new, toasted and charred casks. Aged for more than 2 years, the signature Tennessee High Malt was transferred then to 3 different barrels – crafted by Independent Stave – for an additional 6 months of aging. The result is 3 very different Bourbons bottled at 102 proof in extremely limited quantity. Only 130 cases will be released for limited distribution in Tennessee and Georgia only. Starting in 2011, Chattanooga Whiskey challenged the law and won the right to distill whiskey in Chattanooga for the first time in over 100 years. The Chattanooga Whiskey Experimental Distillery now hosts over 25,000 visitors per year. The Riverfront Distillery is the production home to Chattanooga Whiskey’s signature Tennessee High Malt whiskey, scheduled to release in 2019.